We were given a pleasant surprise by Intel at IDF just a few weeks ago: a fully functional and benchmark-able system based on Intel's next-generation desktop processor, codenamed Conroe. The performance that we saw was stunning and the power efficiency promised is a welcome change from the Pentium 4's NetBurst micro-architecture. But after leaving sunny California and returning to reality, we found another Intel chip in our labs; it just wasn't Conroe. With the heatspreader on top of the chip, you could hardly tell it apart from a Conroe. It looked and smelled like one, but that's where the similarities end. While the fastest Conroe based processors will barely exceed 3.0GHz, this chip is clocked at a mighty 3.73GHz. Indeed, what Intel had sent us was no Conroe. It was the new dual core Pentium Extreme Edition 965, a chip that's being announced today, but one that won't actually be shipping in retail systems until next month. And yes, it's another very high clocked, deeply pipelined CPU from Intel. It's not the power efficient, high performing, competitive part that we want from Intel; it's yet another bump in the rocky road of NetBurst. "Whenever the OS executes the halt instruction, the CPU enters what is known as the halt state. Architecturally, what's going on in a halt state is the clock signal is shut off to the CPU for some period of time. With no clock signal, none of the logic in the chip will do anything and thus power consumption is reduced. Performance is also significantly reduced; however, the halt instruction isn't usually called during application usage, so the performance aspects of the halt state aren't very important. The problem with the halt state is that it does nothing to reduce voltage, only current draw by stopping clocks from going to the CPU. Since Power varies linearly with both current and voltage (P = I * V), you're effectively only addressing half of the problem. The Enhanced Halt State, as Intel calls it, does two things: it reduces the clock speed of the CPU by decreasing the clock multiplier down to its minimum value (on the EE 965 series, that's 14x, or 2.8GHz), then reducing the voltage. The clock speed is reduced and then the voltage is dropped, to maintain stability. Intel insists that the enhanced halt state is a significantly lower power state than the conventional halt state, thanks to the reduction in voltage in addition to the reduction in clock speed. While the standard halt state causes a linear reduction in power, Intel's enhanced halt state causes an exponential decrease in power, potentially offering better power savings than the standard halt state. The real world impact obviously depends on how idle your system happens to be." "What EIST does is very similar to AMD's Cool'n'Quiet. It is demand based reduction in CPU clock speed and voltage. Using the same mechanism of adjusting clock speed and voltage, based on the application demand, the processor will dynamically increase/decrease its clock speed between its minimum clock and its normal operating frequency, as well as voltage, in order to optimize for power consumption. Because of the way EIST (and AMD's Cool'n'Quiet) works, there's inherently a drop in performance. The idea is this: if you're performing a task that's not using 100% of the CPU, the CPU will operate at a slightly reduced frequency in order to conserve power. So, while some tasks will require that the system run at full speed, others will run at lower speeds. " Note that AMD is penalized a bit here because we're testing on an ASUS A8N32-SLI, which effectively features two North Bridges (one masquerading as a South Bridge) to offer two dedicated x16 slots. The two chips together consume more power than NVIDIA's 2 x8 single chip design, so depending on what chipset that you use, AMD's power consumption could be a bit lower. Also, keep in mind that AMD's Cool'n'Quiet is enabled, and the EE 965's C1E support is kicking in to keep its power consumption low at idle as well. With power consumption finally very close between AMD and Intel, who is the true winner here? From AMD's perspective, the FX-60 is a 90nm chip that still consumes less power than Intel's 65nm CPU, and its power consumption will only go down further when AMD ramps up its 65nm process. From Intel's perspective, AMD won't be producing 65nm in volume until 2007, the same year when Intel will start playing with 45nm chips. Not to mention that the EE 965 is made up of 376 million transistors compared to AMD's 233 million, running on a much more power-hungry architecture. So to Intel, being able to almost equal AMD's power consumption on a NetBurst based part is pretty impressive. From our perspective, it's nice that the EE 965 brings power consumption down to a more reasonable level, but what really matters is how well it performs at that relatively similar power envelope. And that's what we'll find out next. In our first look at Intel's Presler core with the Extreme Edition 955, we investigated the benefits of Hyper Threading with a dual core CPU as well as the performance impact of Presler over Smithfield. So, be sure to consult that article if you want a more in-depth look at Intel's 65nm dual core desktop CPU. You guys are really Amazing, jealous of others success, to all of the losers here is going to happene what happend to all the ATI Fan boy, now nvidia is back and there they with the mouth on they assess, if Intel make a faster and better chip then we are the one who should be happy because the price will come down for a better chip. Keep dreaming about AMD is better, that is why every server in mission critical task out there for professional business around the globe use AMD?. Let me see, why Intel Xeon not opteron?, I will get a new chip and that will be Intel I don’t give a damn what some no body think about a company just because they are jealous of the success of that company, just like the geek who use apple, now they are using Intel Chip. Before intel was the worse now they are going to use the very product that they said was so bad and slow, that is what is going to happen to all of you who talk so bad about Intel and the time come, you will do what all of the ATI Fan boy are doing, that is using what is better and that is nvidia. so stop talking like that about Intel, because if not because of Intel you losers will be right now in the toilet with your hand on something else and is not a keyboard. To complain about a "look ahead" during the wrap-up is totally ridiculous. This is why we read these articles, to be informed. If one is gathering information on a current purchase and is not interested in waiting, then one can easily omit the "look ahead's" inclusion. Conroe is being compared in one test area (encoding), an area which is the P4 true strength. The point being made that the P4 will be a soon to be obsolete, not that it outperformed the FX-60. The P4 already demonstrated that. This comparison "HURTS" Intel. Why would Intel pay for that? While the 965 has become a lot more competitive with the FX-60, our overall nod still goes to AMD. For current buyers who must have high-end, AMD is the way to go. Why would Intel pay for a recommendation for an AMD part? AT is recommending a low cost CPU for current buyers and will be releasing a comparison with the specific recommendations next week. How would this comment be biased one way or the other? What CPU or CPU's do you think that they will recommend? Has someone's confidence been shaken? Intel would not pay for a review that essentially says that although the latest P4 is an improvement and brings it closer to what is currently offered by AMD, despite it's strengths in a few areas the overall recommendation after comparing these 2 high-end parts in the P4EE review is the FX-60. To assert that Intel paid for such a recommendation is stupid. 1- The FX-60 is the better overall CPU at this price point. 2- The P4EE is only recommended if it's strengths are the primary requirement. 3- For current buyers, purchase a low cost part and wait for their comparison next week for assistance. 4- If a buyer can wait 3 to 6 months, the Conroe looks to easily outperform the current high-end from both companies at half the cost. AT has been forthright regarding the Conroe and has misrepresented nothing. It was clearly stated when it is to be released, there was no attempt to mislead. The information known about the Conroe should be included in every CPU review and\or comparison at it's performance level or expected price point. How many times have reviews (not just CPU's) ended with "xxxxx coming out in a few months is not expected to provide much benefit" or "xxxxx is due out in a few months, if you can wait you may be better off". This is a common practice and to NOT have this information for consideration would do all readers as well as prospective buyers a disservice. These silly accusations against AT as being "paid off" are pathetic and nothing more than a sign that there is fear in hearts of those who have tied themselves to of all things, a corporation. We can all be thankful that these people are not doing the reviews. To complain about a "look ahead" during the wrap-up is totally ridiculous. Some people really need to grow up. Lets be clear about the comparisons here - AMD X2 and 64 cpu's currently exist and so do the Intel P4's. Conroe isn't a production part, so why are you making comparison's with it, the FX series and the new 965's when Conroe can't be bought?? Why ... well it is clear ... this site has been bought out by Intel just like Toms was a few years back. Intel obviously payed you very well for the positive feedback, and the constant references in benchmarking since eh?? I have always preferred to check Anand's views on new technology in the past as I always considered his reviews balanced. I think this review fell into a serious hole because it essentially isn't of any value, and as a propaganda tool, I feel it has damaged AMD's reputation in the market. AMD and Intel both have prototype silicon capable of much higher level of function than we currently enjoy today, however, none of it is at mass production spec. The Conroe review is flawed because it was reviewed without ever being a production chip. This hypes the market up for Intel, and does unneccessary damage to the fragile market AMD has garnered over the past few years where they have enjoyed a small advantage, both in terms of raw cpu power and lower thermal envelope. AMD is a small company, Intel is huge. Reviewing an engineering sample like this in isolation therefore does more damage than good. I only made my previous point to make it clear that I was outraged - I apologise for the comment. I, like many others, have enjoyed the power that AMD has brought to the PC world with it's competition with Intel. If AMD were not around, we would still have P3's as Intel would have had no competition ... we would also be paying a lot more money for CPU's. Can´t belive Anand is promoting a CPU that will not be launched in next 6 months. I´m not an AMD or Intel fan. I´m fan of my pocket! It´s good to see that in the future we´ll have options, because today we only have one choice, AMD. No, he would tell us to buy the FX-60 rather than the 965 EE, as the FX-60 is better. Well it varies, some reports say Late June, while the most pessimistic reports say September. So anyware from 3 to 6 months away. It's good to know this as in potentially less then half a years time your going to be getting a CPU on the Intel side that will outperform this processor by a large margin 20% or greater, and which cost half the price. 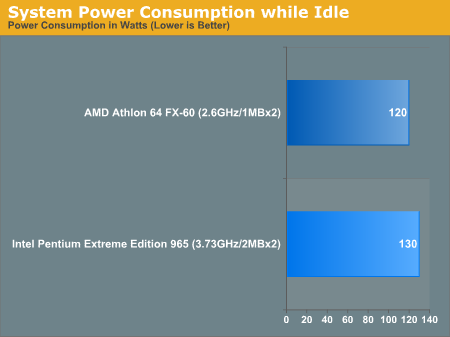 This is like getting an Athlon 64x2 2.2GHZ/2x1MB for 1000US now and in at most 6 months you can get something like Athlon 64x2 2.8GHZ/2x1MB for 500US, using current performance improvement timetables this typically hasn't occured, and such a grand scale of price cuts or performance enhancement in such a short interval of time for CPU's.